The Meat Industry Threatens Our World is a book written by Fabrice Nicolino, a French journalist and environmental advocate. 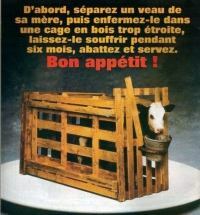 After being published in late 2009, the paperback has received great attention in France as it is the first work ever in French that investigates the nation's factory farms. In this book, Mr. Nicolino explores the history of the bloody and violent livestock industry as well as the savage practice of factory farming and its tremendously negative effects on humanity and our world. He also analyzes the manufacturing of animal products across the globe and concludes that the entire system is a definite and present danger to the survival of humanity and our planet. In an interview with Supreme Master Television, Mr. Nicolino mentioned that people involved in the animal farming business want to make the most money possible from these animals and therefore do not treat them as living beings, ignoring their basic needs to move, run, have friends, and breathe the air outside. The sickening truth behind the meat industry is purposely hidden from the world. Many people are simply unaware that the neatly packaged corpses for sale were once actual living beings that were inhumanely raised and then murdered. Mr. Nicolino wants the public to know exactly where meat comes from and how the animals are treated. During the discussion, Mr. Nicolino described the life of cows in a dairy factory farm as an example. A couple of days after calves are born, they are taken away from their mothers and the milk intended for the babies is now sold for human consumption. These female calves will be sentenced to the same fate as their mothers; that is, being continually impregnated through artificial insemination and repeatedly injected with hormones to force them to produce unnatural quantities of milk, with utterly devastating health consequences such as mastitis, a painful inflammation of the mammary glands. Male calves are usually kept completely immobilized so that their meat will be white instead of pink or red, and after a few months they are killed. Mr. Nicolino also described a poultry farm, where chickens are jammed by the thousands into small, dark enclosures, never to see the sun, and live in utter filth as their waste is rarely, if ever, removed. They are fed massive doses of drugs to make them grow faster and just to keep them alive as diseases are rampant in their appalling living conditions. These illnesses do not stay confined to these facilities; rather, they eventually spread to humans—with lethal consequences! As pointed out by Mr. Nicolino, meat is detrimental to human health. Nowadays, many studies show unmistakably the links between a high consumption of red meat or cooked meats and very serious diseases such as obesity, diabetes, cardiovascular illnesses, and certain types of cancer. The livestock industry is leading us towards a global, planetary catastrophe. Meat is also destroying the principal ecosystems of our world. 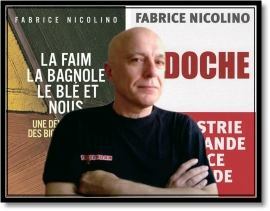 Mr. Nicolino reported that in Brittany, France, a region where an enormous amount of animals are concentrated on only seven percent of the landmass, there have been regular tides, in summer and now in winter also, of scientifically reported nitrogen toxic green algae on the coast for the last 30 years, most of which is caused by animal manure run-off into the rivers going to the ocean. In addition, Mr. Nicolino believes that there is a deep connection between slaughterhouses and the dreadful way that humans are treated in certain crises and appalling wars. He said, "In France, we kill more than a billion farmed animals every year to feed the French people, more than one billion, and they are not only killed but killed in terrible and barbaric conditions. So, this outbreak of barbarity in a society with a peaceful appearance, a democratic appearance, a happy appearance, well what consequences does that have exactly?" Mr. Nicolino sincerely wishes the world would wake up immediately to unite against the savage factory farming system, and encourages action now to end the unfathomable suffering and anguish of our animal friends. We salute Mr. Fabrice Nicolino for his work of bringing the attention of the people of France and beyond to the immediate need of a new era filled with peace and loving care for all God's magnificent creatures. May this beautiful time soon come to pass.